A Solar Powered and Electrified Middle East? 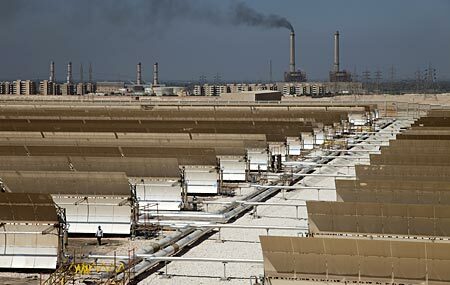 While the world economy gradually turns to renewable energy, is the Middle East following suit? If a non-carbon fuel global economy eventually emerges, how will that impact the Middle East rentier states? The issue of renewable energy (RE) has attracted remarkable little attention in Middle East scholarship, despite the widely held notion that the oil curse is the mainstay of the region’s pervasive authoritarianism. One hardly finds academic articles on RE in the Middle East beyond technical assessments in specialized journals. But there is clearly something going on. In 2012 Saudi officials surprised everyone by announcing an ambitious $109 billion plan for renewable energy, aiming to build “a solar industry that generates a third of the nation’s electricity by 2032”. Although the Saudi plan has suffered delays, other MENA countries, especially UAE, Morocco, Jordan and Egypt, are pushing ahead to reduce their reliance on fossil fuel, in particular by building large-scale solar energy projects. Climate change concerns are only a small part of this shift. For GCC-states, and Saudi Arabia in particular, the shift is motivated by rapid growth in domestic energy consumption and unsustainably high level of fossil-fuel subsidies. In fact, Iran, Iraq, Saudi Arabia and Algeria spend an incredible 5 – 11 percent of their GDP on oil subsidies. In the case of Saudi Arabia, the country’s growing energy needs must be met by other sources. If not, the Kingdom will no longer remain a dominant oil exporter (a “swing producer”). For oil-importing Arab states, like Jordan, the turn to solar energy is partly a response to energy security concerns. The 2003 Iraq war disrupted the flow of cheap Iraqi oil and during the Arab Spring turmoil gas import was severely disrupted, causing chronic energy shortages in the Kingdom. Since most countries in the region burn gas and oil (not coal or nuclear) to produce electricity, new solar energy plants will help stabilize government budgets by reducing fuel import costs or by freeing up reserves for exports. For many countries, urban air pollution has become a driving factor behind the search for clean energy, especially in Iran. Finally, during the past decade solar energy and wind power technologies have become cheaper and are in many cases cost competitive with their fossil rivals even without government subsidies. The Middle East is currently witnessing a tremendous growth in solar energy production. Morocco currently imports more than 90 % of its energy, but its huge Noor Ouarzazate solar energy project is expected upon completion in 2019 to cover a significant part of the country’s annual electricity needs. In 2011 the Egyptian government opened its first solar power plant at Kuraymat, south of Cairo, and a number of new solar energy and wind power project contracts were signed this year, aiming to fulfil an ambitious plan of having 20 % of Egypt’s electricity needs from renewable sources by 2022. In Jordan, the huge Shams Maan Solar Photovoltaic Project was launched in 2015, helping the country reach its goal of having 10 % of its electricity needs from renewable energy by 2020. In Dubai, the Mohammed bin Rashid Al Maktoum Solar Park which opened in 2013, is under continuous expansion. In January this year, the Emirate also tripled its renewable energy target for 2030 to 15%. In Israel, the 134 acre Ketura Solar field opened in July 2015, the largest solar part to be connected to the Israeli grid. The country aims at having 10 % renewable energy by 2020 up from less than 2 % today. In Turkey, solar energy production has also grown significantly over the past few years. The Erdogan government seeks to have at least 30 % of the country’s electricity from renewable energy by 2023. Following a surge of new contracts on solar energy plants, the Middle East Solar Industry Association (MESIA) hailed 2014 as “a breakthrough for solar power in the Middle East”. Solar energy exploitation is not merely the business of governments and their largest private contractors, however. Solar water heaters have long been omnipresent in Israel, Turkey and elsewhere in the region, but new forms of solar energy exploitations are now available and at increasingly more affordable prices. Throughout the Middle East solar panels on private roof tops have become more and more commonplace. In fact, (mostly Chinese) mass production of solar panels has caused a 65-70 % price reduction in less than five years. In Dubai, you may now purchase roof tiles with integrated solar panels. Solar panels in the shape of artificial palm trees are being erected in the wealthy Emirate, and they also come in the shape of coloured glass and are being produced by a Chinese company at factories in Dubai. Solar energy is also sought by the less-than-prosperous. In Yemen, demand for solar panels has gradually picked up in rural areas over the past few years due to inadequate public electricity service. Oil companies operating in the country have funded solar-powered water pumps to Yemeni farmers as part of their “corporate social responsibility strategy”. Following the Saudi led air campaign the demand for solar panels has skyrocketed in Yemeni cities due to fuel shortages and constant power blackouts, and poor Yemenis are digging deep into their pockets to purchase solar panels. Similarly in Gaza, electricity outages and chronic shortages of fuel have encouraged the installment of solar energy systems, not only in private homes, but also at some schools, nurseries and water pump stations. While the expansion of solar (and also wind) energy in the MENA region is perhaps the most visible part of an emerging adaptation to a future without fossil fuel, another and less visible aspect of this renewable turn is the introduction of electric (or hybrid) vehicles (EVs). Recent years have witnessed a remarkable growth in global sales of EVs with more than 300,000 EVs sold in 2014 alone. EVs are not entirely new to the region, however. Back in 2007, the Israel-based Better Place company launched an very ambitious EV-project in which a network of battery swapping stations and an infrastructure of charging stations would serve the drivers of the company’s car, the Renault Fluence ZE. At its peak in 2012 some 21 stations and more than 1,000 charging points operated in Israel. The over-ambitious company sold less than 1,500 cars and went bankrupt in 2013, dealing a blow to EV projects in Israel. The country’s high-tech industry has not abandoned the EV idea entirely though, and is making interesting advances in EV battery technology . Besides Israel, Turkey is the MENA-country with highest EV ambitions. In fact, it is the only country in the region where the world-leading EV producer Tesla Motors is slated to include (in 2016) in its rapidly expanding global supercharger network. (Superchargers enable Tesla drivers to travel long distances with only short charging stops). Turkey has long had a large car industry, producing mostly parts of foreign car brands and running assembly factories. Its attempt to produce its first domestic car in 1961 (the “Devrim” or “Revolution”) failed, but in 2011, the Erdogan government announced that Turkey would once again try to produce its own “national car”. This time, however, the car should be electric. According to Science and Technology Minister Fikri Işık, “Turkey has missed the train for the classic internal combustion motor technology. […] But electric cars present a new window of opportunity”. Turkey wants to be on board when the new-generation electric cars are hitting the market, and is encouraging a multitude of interesting EV projects and prototypes: from the long-range EV proto-type developed by Istanbul University students and the Porsche-like model developed by the ETOX company to a mass market EV proto-type, developed by Derindere Motorlu Araçlar (DMA). The latter is based on a Toyota Corolla and has an impressive 400 km range, but with an uncomfortable price tag of TL 180,000 ($73,300). Its CEO claimed this year to have concluded license deal with three countries for mass production. Turkey had an EV production between 2010-13, when it produced the Renault Fluence Z.E. at Renault’s factory in Bursa-Oyak. Having no charging infrastructure in Turkey, the company sold less than 100 cars to Turkish customers, however. Today, an estimated 100-200 charging stations exist in Turkey and more are being built, but fully electric cars are still few and far between. There is only one fully electric Taxi in Istanbul. The EV fever has clearly not filtered down to the average customer yet. In Dubai, authorities are also promoting EVs. 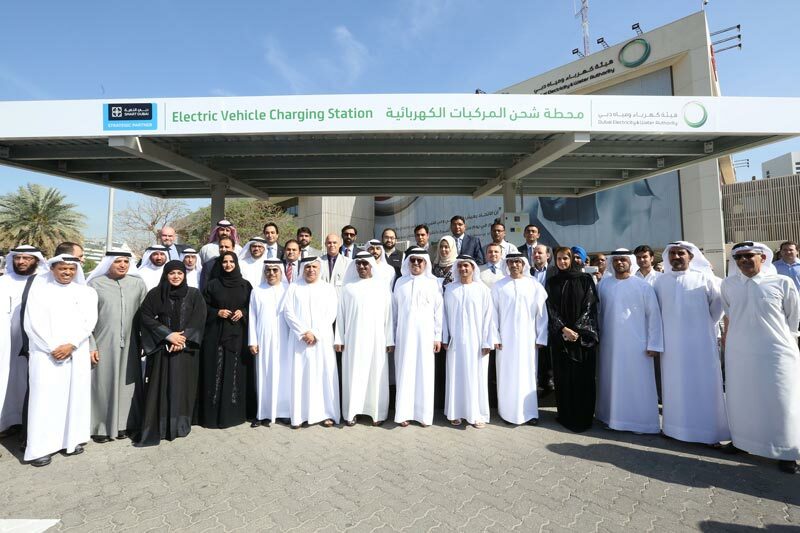 The first EV charging station the UAE opened in Dubai in February 2015 by a royal dignitary from the Maktoum family. Dubai is scheduled to phase in 100 new charging stations in 2015, with 12 of these having a capacity to serve 24 cars at a time. The Dubai Electricity and Water Authority recently purchased eight EVs as part of its car fleet, and the promotion of EVs is part of Dubai’s “Green Transport” Initiative. Various incentives are offered, including special parking slots are reserved for EVs. Luxurious EVs such as the BMW i8 are being sold in small numbers in the GCC countries, and two of them are employed by Dubai’s police force. A pilot project for electric bus transportation in Dubai is also being planned. True to its image of promoting everything spectacular and mind-boggling, Dubai has purchased a specially designed fully-electric “superbus” proto-type capable of driving at 250 kph. The 15 meter futuristic bus with luxurious details and eight gull-wing doors was touted as the “world’s fastest bus” at a trade fare in Dubai in 2011, and the idea was to build a dedicated superbus lane between Abu Dhabi and Dubai. Although car fuel in UAE is still very cheap, the government is considering cutting fuel subsidies. If that happens and the charging infrastructure expands significantly, EVs may also be embraced by the average consumer in Dubai. The increased interest in EVs in the region is partly driven by air pollution concerns, especially in Iran. Tehran and several other Iranian cities are among the most polluted cities in the world. Thousands of premature deaths in Tehran are blamed on air pollution, caused mostly by several millions vehicles in the city. Many Tehran cars are more than 20-years old and/or Iranian-produced models with high emission rates. Another widespread problem is domestically-produced benzene-contaminated car fuel. Following new international sanctions imposed on Iran in 2010 on fuel imports, Iranian refineries tried to boost production by mixing benzene into gasoline, creating a relatively toxic fuel. When the orange haze of smog is at its most extreme, schools have been temporarily closed and strict traffic restrictions imposed. Due to a lack of high-tech refinery capacity in Iran, the oil-producing country is among the world’s largest importer of fossil-fuel. In 2010, the Iranian government decided eventually to reduce its fossil-fuel subsidies (until then a large part of the government budget), causing a 75% price increase in car fuel. Against this background, it is not surprising that Iran looks to electric vehicles as one solution to reduce its air pollution problems and fossil-fuel costs. Various EV initiatives have been launched: the leading Iranian vehicle manufacturer, Iran Khodro Industrial Group, has recently signed contracts with local universities to develop hybrid and electric cars. In March 2015, President Rowhani himself appeared on Iranian TV, driving the Iran Khodro’s new plug-in hybrid EV. The car is part of Iran’s “The National Hybrid Car Project” and has an estimated range of 70-80 km on a single charge. Tehran city is also promoting electric motorcycles and hybrids taxis as the solution to the air pollution crisis. Terra Motors, Japanese EV producer of eco-friendly scooters and tuk-tuks has reportedly partnered with an Iranian car distributor, Jahanro Industrial, to import a fashionable smartphone-connected electric scooter to Iran. At the 2014 International Exhibition of Transportation and Urban Services in Tehran, “everybody was talking about the electric vehicles (EVs)”, according to the organizers, and demand for EVs is reportedly picking up. Tehran municipality plans to ban fossil-fuel vehicles from entering restricted areas of the city, allowing access only to electric motorcycles (MCs). An 2014 government plan aimed at putting 400,000 electric motorcycles on Iranian streets. Government incentives included cash incentives to manufacturers, cheap loans to purchase electric MCs, dedicated free parking slots, free charging, tax and tariff exemptions, etc. As is the case of solar power, the electrification of transportation also has a low-tech and bottom-up dimension which sometimes becomes visible in poor or war-ravaged areas with lack of adequate access to new cars and fossil-fuel. To convert petrol-fuel cars into an electric vehicle is a relatively low-tech affair (see example from Jordan and Turkey). University students in the region have also developed EV proto-types at budget prices (see examples from Morocco, Egypt, and Turkey). While such individual projects rarely move beyond one car, two innovators in Gaza, Waseem Khazendar and Fayaz Anan, responded to the fuel-crisis in 2008 by starting a mini-serial production of electric cars. Their proto-type was an old 1994 Peugeot 205 car model charged with a package of 34 standard lead-acid car batteries. The car reportedly did up to 100 miles on a single charge on the flat coastal roads in Gaza. It reportedly became a “point of pilgrimage” with some 400 Gazans lining up to pay the $2,500 for having their cars “electrified”. 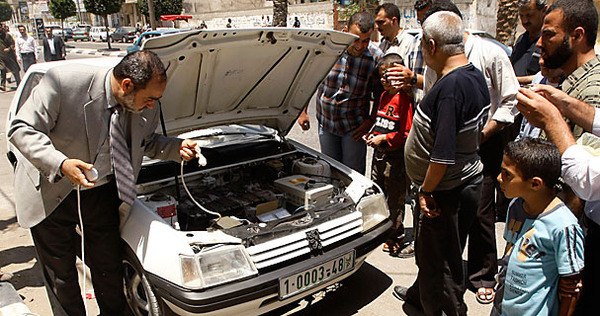 Khazendar and Anan converted some 30-40 cars, but they quickly faced the problem of the Israeli siege as access to batteries and electric motors dried up. 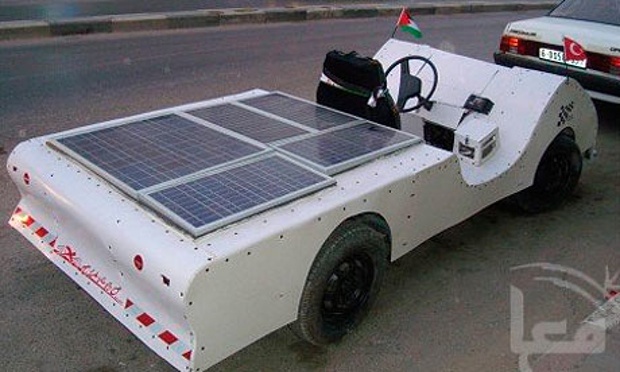 In 2012, another Palestinian entrepreneur in Gaza produced a homemade electric car entirely out of recycled material. It was an admittedly slow-moving and unfashionable vehicle, but with an impressively low price tag. In the West Bank city of Hebron, solar-powered car proto-types have been produced by both Palestinian student teams and a professional engineering company. Both models are akin to slow-moving golf carts, but are cheap to produce and very cheap to “refuel”. Most importantly, they can be produced and fueled locally. Since EV batteries and solar panels are projected to become more affordable and more efficient, these type of local electric “car industry” projects and homemade electric vehicle conversions – already a popular business and hobby in the U.S. – may also become more widespread in the Middle East, especially in areas where war and underdevelopment fosters self-sufficiency and local innovation. The End of the Rentier State? So where is the renewable energy revolution taking us in terms of the future of Middle East politics? Things are moving fast and as noted by a recent study, “perceptions of the role of renewables in the energy mix have not caught up with reality”. The accelerating speed of the ongoing energy revolution will eventually reduce the importance of oil both as a political instrument and geopolitical factor. One cannot take for granted that the current slump in oil prices is just a temporary dip. On the contrary, it may well remain low and perhaps even continue to drop. Current global fossil fuel subsidies amount to a staggering $500 billion annually, while renewable energy in some cases is already beating carbon fuel on the economic market without green subsidies. That spells trouble for the Middle East rentier states and their ruling elites. On the other hand, renewable energy, and solar in particular, holds great promise for local ownership and participation. Much like the cell phone revolution in the third world, large populations without electricity may now “leapfrog” traditional energy systems, and move directly to cost-effective off-grid solar energy systems. The (mostly) decentralized character of solar energy, its infinite supply, and its “off-grid potential” may lay the groundwork for a political structure more amenable to democratic rule. The concept of energy democracy and its leftwing activists have been around for some time and their ideological project may seem somewhat naïve. It remains true, however, that the green energy revolution will erode the material basis for the Middle East rentier state. The dominant “ruling bargain” in the region, temporarily unraveled by the Arab Spring, will be further unsettled by the new energy paradigm. The ruling elites are well aware of the coming challenges, however, and they will have to plan for a future in which popular support and acquiescence cannot be bought by cheap oil and government subsidies.